My grandmother and grandfather passed away at the same day too - but it was my maternal grandmother and paternal grandfather! Given that we all lived in the same city we managed but it was a busy few days, with essentially a double shift in mourning and funeral duties. 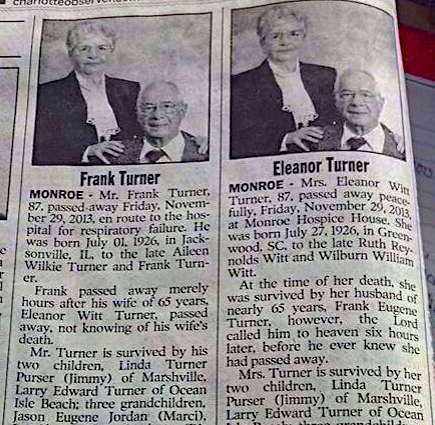 At 58 years married, I hope this is how we go when the time comes. I know I couldn't make it far without her, and I suspect she is the same. Our six kids could have one funereal event for both of us, then get on with their lives. My parents were married 70 years and died within months of each other. I once asked my dad the secret of marriage and he explained it like this: "You take two rough rocks and if you rub them together long enough and hard enough, the rough parts will wear off and the rocks with fit pretty good together.". At their 50th anniversary party, their oldest grandchild declared The 100 Year War half over. At last, it was not what they had rubbed off, but that they were rocks, to the end. We're coming up on our 30th in Feb and the secret to a long and happy marriage is a detached garage. I think the answer - though I am not married - is to remember that it is not all about you any more. Don't be selfish; be giving and forgiving.